Along with the rise of locally sourced produce, artisanal foods, craft beers and the renaissance of basically anything that’s handmade, homemade or just generally more authentic, comes one more item to be better crafted — the cocktail. And one downtown Santa Barbara shop is looking to ride the tide of fancier, tastier drinks. Located just a few doors down from State Street on Ortega, Still — Elevate Your Ethanol opened in late November and offers a wide selection of barware — from handmade wooden drink muddlers to rare and vintage glassware — along with drink additives like high-quality bitters in every flavor from chocolate chilis or toasted pecan to sour cherry or celery. 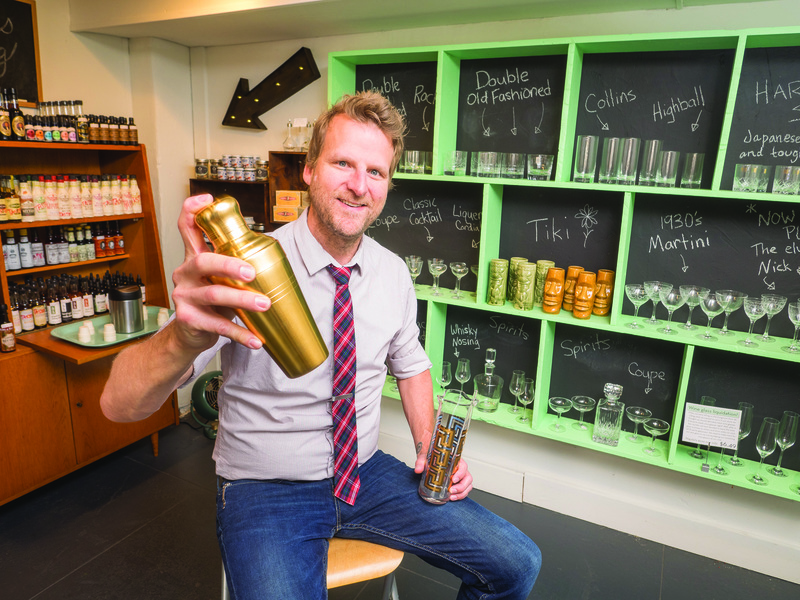 Jeremy Bohrer, owner of the store, opened the boutique’s doors after spending 15 years in the beer, wine and spirits industry. He made the trek from Los Angeles to Santa Barbara after working at the wine and spirits retailer K&L Merchants in Hollywood, where he saw a growing movement of consumers looking for higher quality alcohol. Cocktails are now on the menu for a 21st century makeover, just as Americans’ preferences for beer in the past decade largely evolved from the basic Budweiser to craft beers with trendy labels, generally higher alcohol content and a crispness that takes considerably more work and attention than most mass-produced bargain beers. In 2010, New York Times style writer Jonathan Miles wrote that the 2000s brought back the cocktail — specifically, one with higher quality ingredients, closer attention to detail and better liquor. “People started looking for better booze, for better bitters, and that’s the start of the whole thing,” Bohrer said, adding that crafty concoctions of hard liquor are an L.A. craze that’s hitting Santa Barbara now. He’s had downtown restaurants and bars seeking help in making better crafted drinks, looking for the ingredients or mixology expertise to make the perfect drink. At Still, Bohrer provides shoppers with as much guidance in finding the right tools and ingredients as he does variety. Around the shop, items such as bar tools, cocktail glasses and even a portable Italian globe bar complete with 16th century painting designs are accompanied by signs explaining the product’s function, style and history. In one corner of the shop, a selection of shrubs, a sweet and tangy syrup, is accompanied by an explanation of the syrup’s content — fruit, sugar and vinegar — and its roots in 15th century English drinking. Beside the shrubs display is the self-proclaimed largest selection of bitters in Santa Barbara, offering exotic flavors like firewater and lavender or aromatic and creole bitters. Over the store’s five months in business, Bohrer has added new items gradually and carefully, poring over vintage finds to scoop out the best, such as embellished ‘Nick and Nora’ cocktail glasses from the 1930s and 1940s that go for at least $100 each in any given eBay auction. Bohrer said the boutique’s first days in business were busy, since he opened at the start of the Christmas shopping season, but the winter months proved tough, especially in the seasonal, tourism-dependent market of Santa Barbara. “January and February came and it just stopped,” he said. March and April have fared better, he said, but he’s hoping for a strong summer. While the downtown boutique has brought in customers with its social media efforts and word-of-mouth marketing, Bohrer said he hopes to strengthen formal marketing efforts in the coming months.